It's been a fantastic year for The Oregon Wine Blog. We've met some great people, drank some fabulous wine, enjoyed culinary delights, and experienced the true bounty of our region. We made 78 posts on the blog and grew to a staff of 4 regular contributors, and site visits are up 56% over last year. Early in December we started kicking around the idea of doing a "Best of 2009" feature and nearly immediately hit a roadblock in discussing the logistics of this post. Should it be the best wine we drank in 2009...or the best wine released in 2009...or the our favorite experience associated with the blog during the year? Well, in the true organic style of our blog, we decided that each writer could "do whatever the hell they want" as long as it involves wine and 2009. So here goes - our staff's Best of 2009 - for what it's worth! Narrowing down to a favorite of 2009 was very difficult for me. There are particular wines that stick out, particular experiences that were phenomenal, and as you can probably tell from our posts that we have some wineries that are solidly great, 100% of the time. I decided to focus on a wine and experience that was a surprise, versus a place like Willamette Valley Vineyards where we know it will always excel. The surprise, in a very good way, and my Best of 2009 is Terra Blanca Winery and their 2003 Pantheon. We've detailed a few of the reasons that Terra Blanca is a favorite in previous postings, but in short both times the blog has officially visited the estate we have been blown away by the culture, the experience, and the wine. This summer we had one of those afternoons where we walked through the door expecting to taste through and be out, and we ended up chatting with the winemaker for nearly an hour, getting a wonderful tour of the cellar, and tasting wines that are demonstrative of the Red Mountain amazingness. The 2003 Pantheon is one of those wines. I wish I had purchased a bottle while I was there as it wasn't available the next time I visited the tasting room. A new take on Nebbiolo, the Pantheon is 81% Nebbiolo, 17% Cab Sauv, and 2% Dolcetto and it is everything that is great about an Eastern Washington spin on an Italian wine. As noted by the winemaker, "A full-bodied blend bursting with flavor and the aromas of violets, the Nebbiolo shines while the Cabernet Sauvignon provides the depth and backbone of the wine. On the palate, flavors of cherries and licorice dominate." Thank you, Terra Blanca, for what you are doing in the industry. I don't mean to sound like a broken record mentioning Col Solare again, but the very first bottle of 2005 Col Solare Josh and I enjoyed together has been perhaps the most enjoyable bottle of wine I have ever had the pleasure to uncork. For a full write up, check out the article we wrote. Long story short, Josh and I had been talking about wanting to try Col Solare for quite some time. $75 for a bottle of wine is quite a stretch for two guys that write for a wine blog that creates zero revenue, but I finally pulled the trigger. I had just finished grad school and officially started my career, whilst Josh was getting ready for a business trip to England and having a generally frustrating day. It wasn't anything fancy, but we popped the bottle and reflected on all the great stuff that had happened in recent months while he packed for the trip. The wine itself was phenomenal as well. Col Solare essentially gets first pick of all of Chateau St. Michelle's fruit with the sole purpose of making the best red blend possible This mix of Cab Sauv, Merlot, and Cab Franc succeeded with flying colors. Since then, Josh, Chris, and I later had the opportunity to visit Col Solare's winery on Red Mountain. Not only is their wine phenomenal, but Wendy gave us what I would consider the most special wine tour I have ever had. 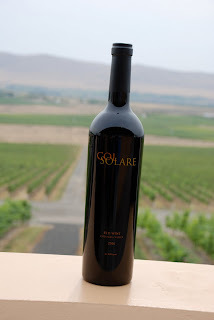 Col Solare could be the most pretentious winery in the entire Northwest, but Wendy's down-to-earth mentality and willingness to be open with us made the experience even better. To pass on word from Wendy herself, it's not invitation-only to go on a tour, but you do need to make an appointment. It is certainly well worth it. When I reflect on what the best or most interesting bottle of wine I had in 2009, one particular wine stands out. As someone who has scoffed at this type of wine in the past, I can't believe I'm about to admit this, but the most interesting wine I drank in 2009 was a Rosé. Yes, I said it. DeLille's 2008 Doyenne Rosé is quite simply the best rosé I’ve ever had. DeLille made this Rosé in the Bandol style; the blend is 70% mourvedre, 15% grenache and 15% cinsault. The wine is a beautiful salmon color in the glass with touches of strawberry and meadow on the nose. The wine has a wonderful crispness to it that make it work very well as a stand alone wine and equally well with food. 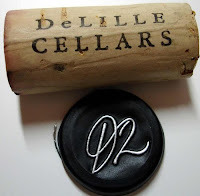 I’ve volunteered at DeLille for a few years and while I think the experience I had with the wine and with the people who are involved in making it contributed to how I felt about it, there is no question that this wine is phenomenal in its own right. 2009 was far from my best year in terms of wine, primarily because I did not drink as much of it as I would have liked. So when the idea came across the staff e-mail asking us to write about our favorite of 2009, it was relatively easy for me. My best of 2009, was, unfortunately, not a wine whose grapes were grown, picked, fermented, or bottled in 2009. This is a bottle from 2004 that I received in the spring of 2008, and this would be the last wine that I had in my old apartment in July before I moved to my new place in August. 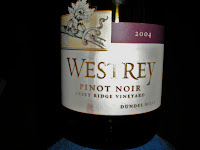 For me, the best of 2009 would be the 2004 Westrey Pinot Noir from Abbey Ridge Vineyard, which is located in the Dundee Hills area of Oregon. I received this bottle of wine at the end of my first academic year at Willamette University (my current employer). After my first year, my role would change and I would no longer be in the same department that originally brought me to Willamette. My Director at the time wanted to give me something as a "going away" gift, and she knew I liked wine, but she herself did not know a lot about wine. She spoke with the Vice President I would now be reporting to. He, has and remains a wine connoisseur, having written wine reviews for either the Statesman or the Oregonian (I forget which one), and this bottle was among the bottles he recommended and I received. I recall very clearly the day I opened this Pinot Noir. I had two friends, Ross and Denise visiting from Chicago - they decided to spend their one year wedding anniversary in Oregon, and spent a couple of days with me. We had spent the day driving up the Pacific Coast Highway, and had traveled from Salem to Newport to Lincoln City to Tillamook, and back to Salem. After such a long day, I thought it would be best to unwind with a bottle of wine, and as we had had a couple of really warm days and I was worried about this wine going bad, I thought it would be a great treat to have. I remember three things about this wine - the color, the nose, and way it was on the palate. The color - a rich red that was bold and stood out, yet it still had some transparency to it. The nose - oaky and spicy in a way that put a smile on your face. When sniffing this wine, you knew you were about to enjoy a great glass of wine. The palate - the way this wine landed on your palate, coated it, and you tasted every aspect of the wine - made you tingle. I remember enjoying the spices and the way they were subtle and not overpowering, and how my sense of smell enhanced the way my sense of taste absorbed this wine, and my brain processed it. In short, having this pinot was a full body experience. This wine will hold a place in my heart for so many reasons and I am glad that I can say this was my best wine of 2009. There we have it folks, 2009 is in the bag. As you can see, each special bottle has a backstory to it that makes it all the more meaningful to each of us. What is your "best of", in whatever non-linear way you define best?